My Master's thesis has finally been published! You can view my thesis here (faster) or on The University of Alabama Electronic Theses and Dissertations database. I started this research with absolutely no CFD experience. I am quite proud of the fact that I was able to learn enough that I am now considered by many to be an expert. When I look at how far I have come in the last three years, it truly amazes me. I never thought I would learn so much. Thanks to everyone who supported me while I worked on this research, and thanks for your continued support as I continue in my studies. When I was a kid, I had a 3-channel Cub-like RC airplane. While in storage, the aircraft suffered some rather severe hangar rash. The damage was the result of the unexpected compression load applied to the fuselage due to poor visibility conditions. In other words, I stepped on the plane because it was dark. After I recently "retired" another aircraft when the wing incidence started varying mid-flight, I decided it was time to rebuild the old . The fuselage had been collapsed into itself, so I still had most of the broken pieces after all the years. This made reconstruction a great deal easier. 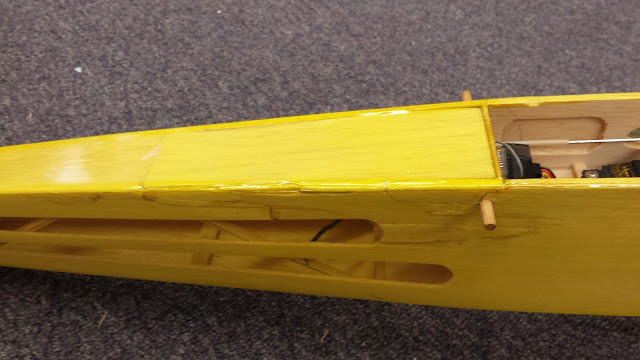 Using copious amounts of wood glue and CA, and just a couple pieces of new balsa, the aircraft was ready for a new skin. 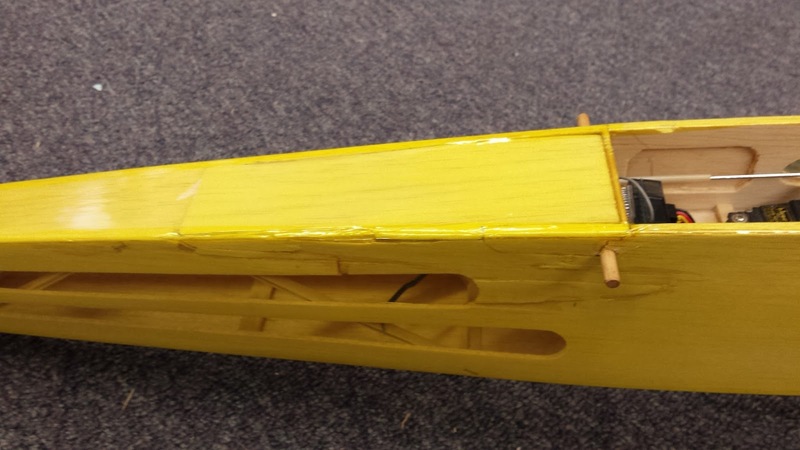 I opted to replace all of the skin because the old skin would no longer adhere to the balsa. I removed the existing skin and gave the airframe a new skin of Ultracote Lite (transparent yellow). I found that it is easy to work with, it adheres well, and it gives a very nice finish. The "Lite" version is substantially thinner than the normal stuff. The completed repair of the fuselage damage. This spot on the wing had also been damaged. 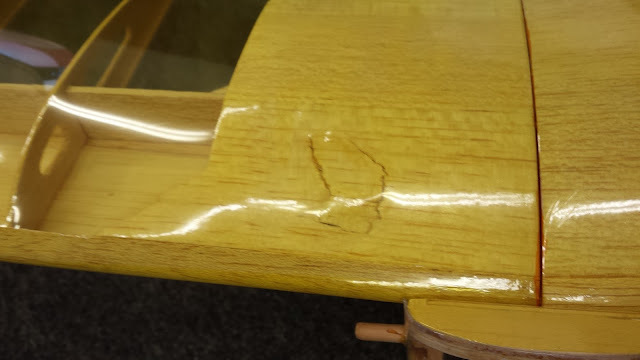 The broken piece was glued back in place. In addition to structural repairs, I decided that it was a good time to modernize the components. Gone are the 72 MHz receiver, brushed motor, gearbox, ESC, and NiMh (NiCd?) battery. 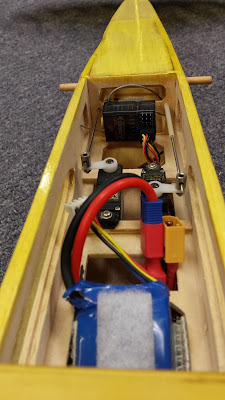 I now have a Spektrum 2.4 GHz receiver, brushless motor and ESC, and a 3s LiPo battery. I fabricated a motor mount to convert the aircraft from a brushed inrunner motor to a brushless outrunner. 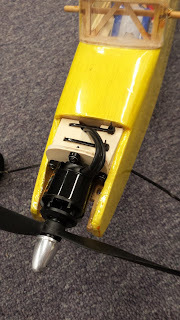 The entire motor mount assembly is attached to the airframe using a couple of cable ties through existing holes, so I can easily remove it if needed. With this motor, the aircraft has much more power than it needs. The thrust-to-weight ratio is about 2, so it can climb vertically. I also added a Mobius ActionCam to record video of my flights. 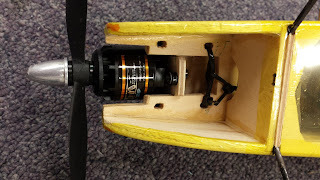 I mounted the camera on the bottom of the fuselage, directly at the center of gravity. A piece of 1/8-inch birch plywood on the inside of the fuselage acts as a reinforcement plate, distributing the load to the balsa fuselage. The camera mount simply bolts onto the fuselage. 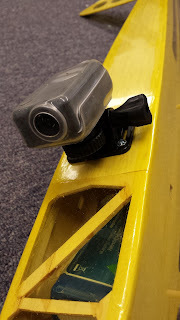 You can see some footage recorded with this camera below and on my YouTube channel. You can see the reinforcement plate for the camera at the bottom of the fuselage. The total weight of the aircraft with battery and camera installed is 1 lb 15 oz. Because I used parts that I already had lying around, the total cost of the rebuild was about $5 plus my time. Overall, I am pleased with the quality of the rebuild. Of course, the point of undertaking this repair was to get the aircraft flying again. So early one morning, I took it to the soccer field for a test flight. It turns out that 8:00 AM is a good time to fly for a number of reasons. Not only is it the most convenient time for me, but also the soccer fields are not in use, the weather is usually calm, and the lighting is perfect for filming to the west. The aircraft itself performs very well. Since the aircraft has no ailerons, it relies on the dihedral of the wing to produce a rolling moment with rudder deflection. 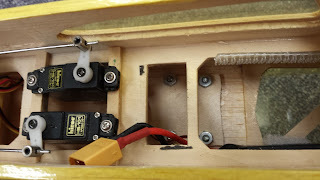 I mapped the rudder to the aileron channel on my transmitter. The dynamic roll response is surprisingly fast. Truth be told, I only notice the lack of ailerons during slow flight. With the salvaged parts I had on hand, the aircraft has much more power than it needs. I estimate the thrust-to-weight ratio to be about 2, so it can climb vertically with no problem. The recorded flight lasted 10 minutes, and the 3S 2200 mAh battery was still at 11.8 V at the end of the flight. Having successfully resurrected the aircraft, it is only appropriate to give it a suitable name. I like to name things after mythological entities, and I think Dionysus fits pretty well given the story. I just hope I don't have to change the name to Osiris down the road. Since my last post, I interned at NASA, defended my thesis, earned my Master's degree, started the Ph.D. program on a fellowship, rebuilt and modernized an old 3-channel RC aircraft, started programming microcontrollers, and helped design, build, and fly an aircraft that uses thousands of volts to generate plasma in the name of research. Oh, and I bought new furniture. I finally have a sofa. I will eventually write about all of those topics (sans sofa), but this post is more of an indication that I am still here. Stay tuned for more.